Cherese McLain(’06) has recently joined the Echohawk Law Offices in Pocatello, Idaho. Congrats Cherese! Elizabeth Cheney (’05) has moved back to Alaska. She is now the Policy Analyst & Planner for Legal & Intergovernmental Affairs for the Alaska Native Tribal Health Consortium. The Presiding Judge serves as the head of the Tribal Court, overseeing court operations and the disposition of cases. The Presiding Judge ensures the impartial administration of justice and discharges duties in accordance with the Kalispel Tribal Constitution, laws, codes, ordinances and regulations. Chairs internal judges’ meetings and serves as liaison to the Tribal Business Committee (KBC) on judicial concerns. Fairly and impartially hears and decides judicial matters within the jurisdiction of the Kalispel Tribal Court (Court), pursuant to the Kalispel Tribal Constitution, Tribal Codes and the policies and procedures of the Court. Supervises and oversees Court operations, including the assignment of cases to traditional or associate judges as appropriate, case management and the timeliness of decisions. Hears and decides all type of cases filed in the Court, including but not limited to, criminal, traffic, civil, juvenile and child welfare cases. Reviews case files and pleadings; presides at pre-conferences, hearings and trials; conducts legal research and writes decisions; issues search and seizure warrants, arrest warrants and court orders, including orders of protection. Assists the Court Administrator to set the Court docket, to develop and manage the Court budget, and to develop and manage Court programs and grants. Ensures the availability of judges by phone; 24 hours per day / 365 days per year, to hear requests for extradition warrants, search warrants, bench warrants and other orders of an immediate nature. Applies fair concepts and procedures of justice, including working closely with the Chief (traditional) Judge, and Associate Judge to incorporate the principles of Kalispel Tribal traditions and culture. Assists with the development of alternate dispositions for juvenile cases, with the development of alternative dispute resolution procedures and the development of Kalispel Tribal common law. Oversees the development of rules of evidence, bench book, and civil and criminal procedures. Ensures the establishment of contracts for jail and detention facilities, and the establishment of full faith and credit agreements with state and tribal courts. Ensures the maintenance of a court record system and oversees maintenance of the Court library. Keeps current on laws and issues that impact the Court, to include continuing legal and judicial education, and makes recommendations to the Kalispel Business Committee for amendments or adoption of laws to improve the tribal legal & judicial system. Serves as an advocate and educator for the Kalispel Tribal Court System within the Tribe as well as locally, regionally and nationally. Professionally represents the Tribe in negotiation or mediation sessions, public and private meetings, and at consultations or conferences. Participates in local, regional and national professional associations. A Juris Doctorate degree from an accredited law school is required. A minimum of ten years experience as a practicing attorney and a minimum of five years of judicial experience or a combination thereof is required. Demonstrated knowledge of Tribal, Federal, and State laws, of the Tribal Court legal process and working knowledge of tribal codes, traditions and customs is required. Demonstrated knowledge of legal practices and standards, and court procedures. Must be fully conversant in the complexities of criminal and civil law in general; and in the complexities of both statutory and case law of federal Indian law in particular. Experience as a tribal judge and/or practice in the field of Indian Law and sovereignty is preferred. Possess strong management, supervisory and administrative skills. Have experience that demonstrates the ability to make judgments in an independent, responsible and impartial manner. Possess excellent decision-making capabilities and dispute resolution skills, including the ability to deal well with emotionally charged and/or adversarial situations. Must possess a good understanding of the needs and vision of the Kalispel Tribe. Ability to of tactfully handle culturally sensitive issues. Must be able to work effectively with elected Tribal leaders, officials and the general public. No convictions of a felony or misdemeanor involving moral turpitude. Must pass pre-employment background check and drug and alcohol screening. Must be licensed in the state of Washington to practice law. Valid WA or ID Driver’s License and insurability under the Tribe’s auto policy. This position is performed primarily in an office environment. Significant portions of the job require extended sedentary periods; regular work with computers and repetitive motion of hands and wrists. This position requires the ability to bend, stoop, lift, carry, and move items weighting up to _25__ pounds and requires occasional standing or walking. This position requires occasional local and out of town travel. This position occasionally requires work to be performed outside general business hours, including evening or weekend sessions, meetings/travel. January 11, 2008 – NABA-AZ Planning Meeting at the ASU Law Library 12 p.m. – 1 p.m.
Additional information will be sent out closer to each event. Hope to see you there! Wishing you and your families a Happy Holiday Season! A new course designed to help law students improve their performance on the Arizona Bar Exam has been organized for next semester by Professor Michael Berch of the Sandra Day O’Connor College of Law. The free, non-credit course will be taught by Berch and 16 other law professors and adjuncts. It will meet from 3:30-6 p.m. on Fridays, beginning Jan. 18, and requires no registration. Third-year law students who will graduate in May, first- and second-year students who want a preview of exam preparation, as well as any previous graduates still preparing to take the exam, are all welcome to attend. Each session will give an overview of a section of the bar, including real property, Constitutional law, evidence, community property, torts, criminal procedure/constitutional aspects, criminal law, contracts, professional responsibility, trusts and wills, civil procedure and corporations, partnerships and other business organizations. A four-person panel will discuss studying for the bar. Students can come to one session or all. Professor Bob Bartels will cover evidence. “I think it should be possible to identify and discuss some points about how to approach bar-exam evidence questions that will add to the standard bar-review lectures,” Bartels said. Berch said the course is not intended to replace the more intense bar review courses offered by private companies, but instead would supplement those courses. “The bar-prep courses are often straight lectures, and I hope these will be more interactive, allowing students to ask questions,” Berch said. A Uniform Commercial Code course offered by Dale Furnish will be announced at a later date. President Bush on Thursday nominated Diane J. Humetewa, a 1993 graduate of the Sandra Day O’Connor College of Law, to serve as U.S. Attorney for Arizona. If confirmed by the U.S. Senate, Humetewa, a member of the Hopi tribe, would be the first Native American appointed to the position. Humetewa is the senior litigation counsel and tribal liaison in the Arizona U.S. Attorney’s Office and serves as an appellate court judge for the Hopi Tribal Court. Humetewa, 42, told the Associated Press that she was “extremely honored” by the nomination, but declined to comment further, saying it was too early in the process. Humetewa, who served as a counsel to the U.S. Senate Committee on Indian Affairs from August 1993 to March 1996, when Sen. John McCain, R-Ariz., was chairman of the panel, has been an Assistant U.S. Attorney for six U.S. Attorneys. Among the guests at Kevin Gover’s farewellparty were, from left, Jacob Moore, of ASU’sOffice of Public Affairs, Patricia White, deanof the College of Law, Gover, and SandraFerniza, also of the Office of Public Affairs. 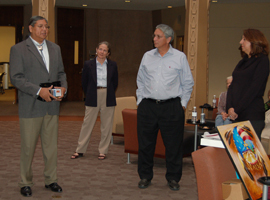 Colleagues, students and friends of Kevin Gover, a professor of the Sandra Day O’Connor College of Law and co-executive director of the American Indian Policy Institute at Arizona State University, honored him with symbolic gifts and fond congratulations during a farewell party on Nov. 26. Gover, a former Assistant Secretary of the Interior for Indian Affairs, is returning to Washington, D.C., to accept an appointment as director of the Smithsonian’s National Museum of the American Indian, effective Dec. 2. Gover, who will remain a professor at the law school on leave for the duration of his time at the museum, will be welcomed back with open arms whenever he chooses, said Patricia White, dean of the College of Law. Gover, who practiced law in Washington, D.C., and Albuquerque before serving as Assistant Secretary of the Interior for Indian Affairs, joined the College of Law in 2003. “We didn’t come here with any thought in mind that this was a way station, or that we were just passing through, but rather with the expectation and hope that this would be a place where we would do something completely different, something that seemed worthwhile, important and noteworthy,” said Gover, who also is an affiliate professor in the American Indian Studies Program at ASU. “My hopes and my expectations were not only fulfilled, they were exceeded. “It means a great deal to be accepted here, into such an elite, intellectual, remarkable family.” Complimenting his colleagues in the renowned Indian Legal Program, Gover said he was certain the program would continue to blossom, and he praised the American Indian Policy Institute as one of the most important such enterprises in the country. Pat Mariella, the institute’s director, presented Gover with a plaque and thanked him for his leadership, while Eddie Brown, the institute’s co-executive director with Gover, gave him an ASU polo shirt to remind him of his academic roots. Gover said his desire to continue helping Native people tell their stories led, in part, to his decision to accept the appointment to the Smithsonian. He also said the new job “seemed like what I’m supposed to do now. I’m very hopeful that it won’t be too long that it seems I’m supposed to come back. I really do like it here, in no small part because of our students. “I look forward to when I’m in my rocking chair, and I say, `Oh, yeah, that was my student.’ I know the contributions these students will make,” he said. Myriad laws govern the intersection of American Indian tribes with the rest of the nation. Among other issues, Indian law touches on land, water and environment, business and family. Gaming has become a hot topic, and many attorneys’ billable hours involve gaming ordinances and policies. As tribal governments grow ever more sophisticated, experts on understanding the interaction of tribes with other governmental entities is paramount. More and more tribes and tribal members are doing business with non-Indian firms, making commercial codes, dispute resolution and contract law a must with Indian law attorneys. Attorneys whose practice takes them into dealings with both tribal governments and individual Indians must have a firm grasp on not just federal, state and local laws, but on tribal ordinances. But where can attorneys and law students acquire the expertise necessary to navigate the maze of tribal, state and federal laws? They turn to schools like Arizona State University’s Indian Legal Program, headquartered at the Sandra Day O’Connor School of Law. The program was established in 1988 to train attorneys in Indian law, assisting them in understanding how tribal laws differ from federal and state law – and how they resemble each other’s systems. Its mission includes providing legal education and public service to tribal governments, and helping support tribes in policy development. As one of the nation’s largest, the program provides its students with both a firm foundation in Indian law and a wealth of practical work experience. “As people learn more about tribes and with all the economic development growth in Indian Country, the field of Indian law grows,” says Kathlene Rosier, the program’s director. “It’s exciting to see it grow. We see more and more people coming to do business on reservations, and it’s important to know how legal systems interact.” Rosier, a Comanche whose last position was tribal prosecutor for the Gila River Indian Community, oversees the program, which trains 10 to 15 native law students from the United States, Canada and Mexico and a number of non-Indians who sign up for the program’s Indian law certificate each year. The school also holds a number of conferences, such as one in 2008 on the effects of 20 years under the Indian Gaming Regulatory Act, which in 1988 paved the way for tribal casinos in Arizona and other states. Students in the program can develop their tribal law portfolios in several ways. In addition to ASU’s law degree, students can earn an Indian Law Certificate. The master of law, or L.L.M., degree in tribal law and government provides those who already have a juris doctorate (JD) or equivalent with an opportunity to increase their skills and knowledge specifically in the area of Indian law. For those who do not wish to practice law, but have a need or interest in tribal law, the master of legal studies or M.L.S. program provides students with the basics of law while allowing them to choose from elective classes to gain the tribal law knowledge they desire. The school has also attracted some stellar academic talent. Professor Paul Bender is a well-known figure in Arizona jurisprudence. Bender, who has argued two dozen cases before the U.S. Supreme Court, is the dean emeritus of the law school. 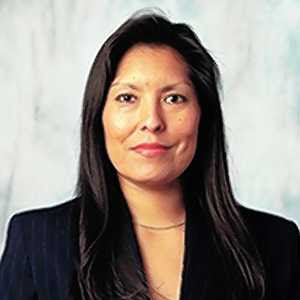 Indian Legal Program Executive Director Rebecca Tsosie is acknowledged as one of Indian Country’s top attorneys. Tsosie, a Yaqui, is also an acclaimed legal scholar who serves as a Supreme Court justice for several tribal court systems. Tsosie has written and published widely on doctrinal and theoretical issues related to tribal sovereignty, environmental policy and cultural rights. Professor Kevin Gover, former Bureau of Indian Affairs head and a Pawnee, is headed back to Washington to take the reins of the National Museum of the American Indian. However, Rosier notes that he’s still associated with the law school, and will be back in town for the Indian Gaming Regulatory Act conference. The program’s 100-plus alumni provide another valuable resource. Ranging from attorneys in private practice to the Arizona Governor’s Office and the U.S. Senate Committee on Indian Affairs, program graduates are making their mark in tribal law. In fact, the only limitation on the clinic’s caseload is the physical distance of the court from ASU’s Tempe campus, which is why the majority of cases accepted are local, says Ferguson-Bohnee. “But they will travel for big cases.” Clients don’t even have to be from an Arizona tribe. “Urban Indians living in the Phoenix area also have legal issues related to Indian law,” she says. Cases may range from child custody and Indian Child Welfare Act cases, to helping draft policy documents for tribal, state or federal governments. One big issue that Ferguson-Bohnee’s team and the entire Indian Legal Program is tackling: probate. With recent changes to federal Indian probate laws, including the requirement that any Indian who owns allotted property within reservation borders have a written will to prevent further “fractionation” of land, Indian law practitioners are learning how to address the new policies and provide support to tribes in rewriting probate ordinances. Students’ motivations vary, but all appear to have a passion for the law. Nikki Borchardt, a member of the Southern Paiute Tribe of Utah, has a background in ethnography, but she always knew she was headed for law school: “My aunt was the tribal chairwoman,” says Borchardt, a second-year student. “I knew there was a need for lawyers.” She pushed to keep her grades high to ensure entry into a good school. “I worked as an ethnographer and archaeologist” before going to law school, she says. Borchardt intends to someday return to cultural resources work. “This is just the next step,” she says. “We’re starting to see how Indian law impacts every aspect of life.” Borchardt also praises the active role the program’s alumni play in helping students with networking and support. Mary Modrich-Alvarado, Jicarilla Apache/Mayan, decided on ASU because it was close to her New Mexico home. The third-year student who has a business degree was undecided what to do after graduation. “I was talking with my sister, guessing what to do next and we started talking about law,” says Modrich-Alvarado, who also intends to actively practice after finishing her degree. In order to practice at Navajo, however, Clark, a third-year student will have to jump through some unique hoops. “I’m going to take the Arizona, New Mexico and Navajo Nation bar exams,” he says. Clark also wants to help change the perception many people still have about tribal courts. “Navajo Nation’s judiciary is independent,” he says. “We’re not new to the game. The field of Indian law is growing across the nation. More than 15 other universities offer Indian law certificates or have legal programs geared to tribal law. Two states – New Mexico and Washington – now have Indian law questions on their bar exams. Arizona’s Indian law practitioners would also like to see tribal law placed on the Arizona bar exam, and the Native American Bar Association is working toward that goal. Description: Tribal Prosecutor to investigate violations of Tribal Law through Tribal Police Department, prepare and present criminal cases in Tribal and Appellate Courts, and enforce child support judgments. Works under direct supervision of Attorney General. Requires graduation from ABA accredited law school, 3 years practice of law, knowledge/experience in Federal Indian Law, and admission to Arizona or California State Bar. Annual salary D.O.E. with benefits. Employer: Southern Arizona Legal Aid, Inc.
– Applicant must have a demonstrated commitment and sensitivity to the low- income community.